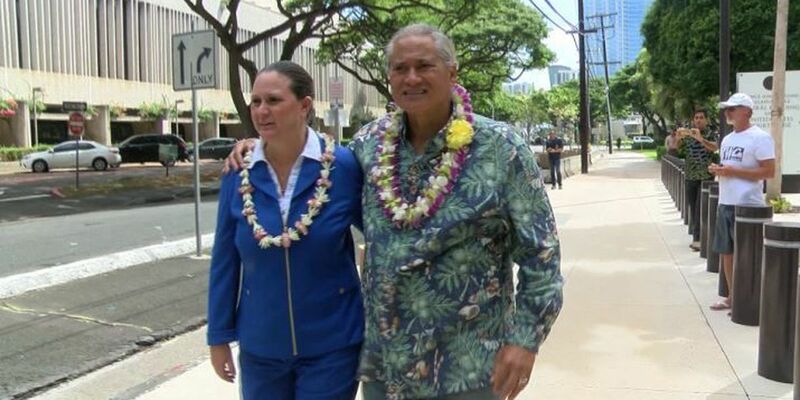 HONOLULU (HawaiiNewsNow) - In an extraordinary scene three years in the making, former Police Chief Louis Kealoha and his deputy prosecutor wife stood before a federal judge Friday after being arrested and indicted in a public corruption probe that also netted the arrests of three current police officers and a retired major this week. Louis and Katherine Kealoha entered pleas of not guilty, hours after surrendering to the FBI at their Kahala condo. The two were each released on $100,000 bonds, with a trial date set for Dec. 19, and left the courtroom holding hands and wearing leis. 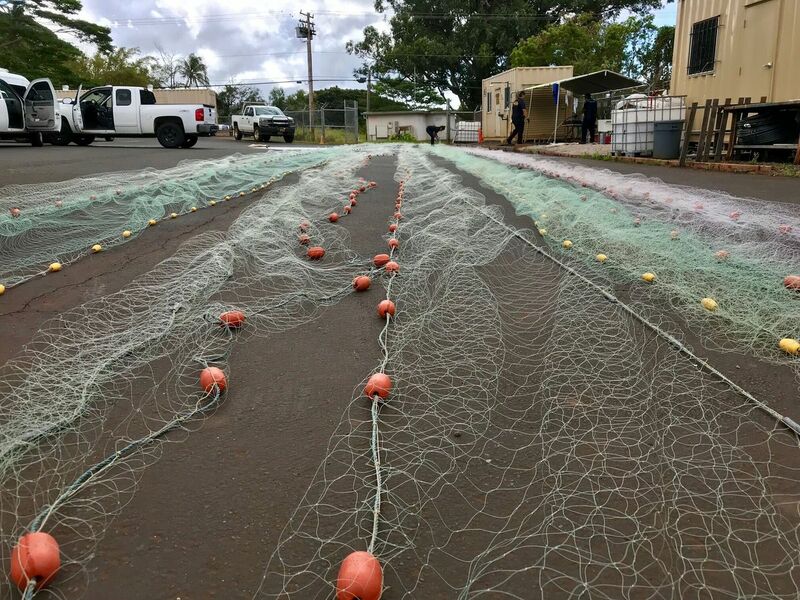 "We appreciate the continued community support and we look forward to our day in court," Louis Kealoha told reporters. In court Friday, federal prosecutors sought to argue that Katherine Kealoha should be detained without bond due to "multiple acts of obstruction." They also said she used more than 10 different encrypted phone lines to contact witnesses while the federal grand jury proceedings were underway, and has shown she is willing to destroy and falsify evidence. But the federal judge didn't buy the argument, and said she should be released. The two left the federal courthouse about 12:30 p.m., as the FBI and HPD brass stood shoulder-to-shoulder to detail the severity of the charges against a couple accused of wielding the power of their positions for their own gain. "The 20-count indictment describes a complex web of fraud, deception and obstruction by a husband and wife team so desperate to fund their lifestyle and maintain their self-professed status as Honolulu's power couple that they swindled hundreds of thousands of dollars from banks, credit unions and some of the most vulnerable members of the community, including a disabled uncle, a 98-year-old grandmother and two minor children who were under Katherine Kealoha's guardianship," said acting U.S. attorney Alana Robinson, at the news conference. "The Kealohas used their considerable power and influence as public officials to launch a secret campaign to cover up their financial crimes ... with the help of a few friends from the department's elite intelligence unit." She added, "No one, not a police chief, not a prosecutor is above the law. Certainly this case has rocked the police department for some time now, but today is a new beginning." HPD acting Police Chief Cary Okimoto said the arrests this week "hurt the Honolulu Police Department and the entire community." "HPD has been and will continue to cooperate with the federal investigators," he said. The arrests are a dramatic — but not unexpected — development in a years-long federal investigation into public corruption at some of the highest levels of Oahu's law enforcement. In a comprehensive (and, at times, jaw-dropping) 42-page indictment unsealed Friday, the Kealohas were charged with fraud, making false statements, conspiracy and tampering with witnesses. Additionally, Katherine Kealoha was charged with bank fraud and identity theft. After the arrests Friday, Mayor Kirk Caldwell said in a statement that Oahu residents "deserve to know what happened and expect justice to be served." He continued, "I thank the men and women of our police force who have continued to do their jobs every day with professionalism and without hesitation." The Honolulu Police Commission, meanwhile, said it is focused on "selecting a new chief and on supporting the men and women of HPD." "We at the police commission respect the decisions that the grand jury has made and leave the question of whether crimes were committed to the criminal justice system," the commission said. 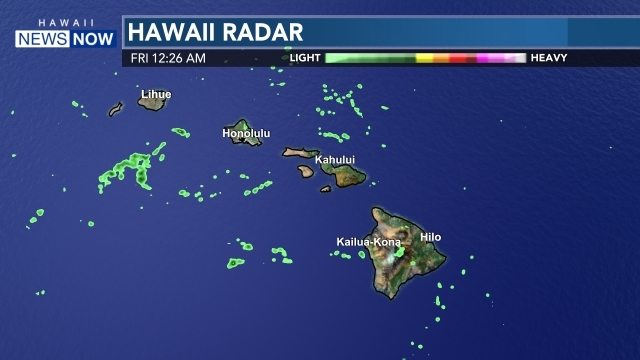 The Honolulu prosecutor's office confirmed Friday that Katherine Kealoha had been placed on leave without pay pending the outcome of the case. The arrests came two days after FBI investigators executed search warrants at homes belonging to the former chief and his wife. Also arrested Friday was Honolulu police officer Danny Sellers, who is known as "co-conspirator 5" in criminal complaints against those involved in the case. Two other HPD officers and a retired major were charged earlier this week in connection with the probe, which sought to unravel what prosecutors allege was a bogus theft of the Kealoha's mailbox in June 2013 engineered to frame Gerard Puana, Katherine Kealoha's uncle, with a federal crime. At the time, the two sides were involved in a bitter family dispute over money. Katherine Kealoha allegedly misappropriated trust funds — totaling $167,000 — of two minors for whom she served as a guardian. She's also accused of stealing from her uncle and her grandmother in an investment scheme and by using the proceeds of a reverse mortgage for herself. The indictment lists $92,355 the Kealohas allegedly used from the reverse mortgage proceeds on their own expenses. The spending includes $26,000 to the Sheraton Waikiki for a celebration lunch when Louis Kealoha was selected as police chief, $10,600 for Mercedes Benz and Maserati car payments. nearly $4,000 on travel expenses, and more than $2,000 for Elton John tickets. As part of the conspiracy, the Kealohas "would improperly use their authority as public officials to prevent the discovery and disclosure of their precarious financial condition and prior malfeasance," the indictment said. It also alleges the two "would target members of the community who threatened (their) power and financial condition." Their victims, the indictment says, included Katherine Kealoha's uncle and her grandmother, Florence Puana. In addition to the alleged fake mailbox theft aimed at framing Puana, the indictment says Kealoha's uncle was the subject of illegal surveillance, and that Kealoha used her office to try to get her uncle convicted. The indictment also demands that the Kealohas forfeit a home and a gold Rolex watch. The Kealohas' arrests have been anticipated for months, and come two years after a federal grand jury investigating allegations against the former chief, his wife and elite members of the Honolulu Police Department met for the first time. The theft of the Kealohas' mailbox in 2013 was caught on tape, and seemed like an open and shut case. Puana, Katherine Kealoha's uncle, went on federal trial. But abruptly, Louis Kealoha caused a mistrial by wrongly telling the jury Puana had a prior burglary conviction. Alexander Silvert, Puana's attorney, said he believed the move was intentional and he went to the FBI. He alleged the Kealohas and an elite police unit, called the Criminal Intelligence Unit, organized a fake theft to frame Puana. The chief denied he had any role. "I know what it looks like and there's no preferential treatment," he said at the time. But in 2014, the FBI began investigating. And the following year, the Justice Department brought in San Diego deputy U.S. Attorney Michael Wheat, an expert in civil rights and corruption cases, to begin the grand jury investigation. The Kealohas hired prominent defense attorney Myles Breiner last year. "So we expect at some point an indictment," Breiner said, in May 2016. Several months later, the FBI alerted Kealoha in a letter that he was a target in the investigation. Several officers also got the target letters. And in January, Kealoha agreed to resign amid the broadening investigation. To retire early, he got a $250,000 payoff from the Honolulu Police Commission. Meanwhile, the FBI also began focusing on city Prosecutor Keith Kaneshiro, who kept deputy prosecutor Katherine Kealoha on the payroll despite a host of serious accusations against her, from selective prosecution to ticket fixing. Throughout the probe, the Kealohas have maintained their innocence. And an attorney for one of the officers arrested argues that the federal government hasn't made its case. On Wednesday, police Lt. Derek Hahn became the third Honolulu police officer charged in connection with the corruption probe. The FBI arrested Hahn, a 20-year veteran of the force, at his Hawaii Kai home. He was charged with conspiracy to obstruct. According to a criminal complaint, Hahn falsified records and made false statements regarding the alleged fake mailbox theft. During court proceedings on Wednesday, federal prosecutors claimed Hahn "called the shots" on the frame-up of Puana and said Hahn had a direct hand in destroying evidence. But Hahn's attorney, Birney Bervar, disputes the FBI's version of events. He said the mailbox theft was a real crime that was poorly investigated. "Mistakes and sloppy police work and inaccurate police reports are a daily occurrence in the state courts here in Hawaii," he said. "That doesn't mean there is a criminal conspiracy." Former HPD Maj. Gordon Shiraishi, 61, and HPD officer Bobby Nguyen, 43, were the first people arrested and charged in connection with the probe. Shiraishi has been charged with obstruction of justice, while Nguyen has been charged with conspiracy to obstruct. In December, retired officer Niall Silva pleaded guilty to lying under oath as part of the alleged conspiracy to frame Puana with a federal crime.